When “The Parent Trap” came out in 1961, I was in high school. It starred Haley Mills and was distinctly a “girl’s movie.” I avoided it like a pubescent plague. Indeed, I continued avoiding it for over forty years until the DVD showed up on my doorstep. I admit I still tried to avoid it, but my wife was ecstatic; it was one of her favorite movies when she was young. Needless to say, I approached the whole affair with a degree of trepidation. I shouldn’t have. I was mildly relieved to find it’s a pleasant-enough children’s entertainment that should also hold up pretty well for kids today. For adults, I make no such guarantees, but it’s sure to win over a few folks who might beforehand have thought otherwise. The Disney studios present both the movie and a load of extras in a special edition, two-disc set. Ms. Mills, in her early teens at the time, plays a pair of twins, aged thirteen. Yes, a pair of twins. Thanks to some amazingly good trick photography that is as convincing as ever and some excellent acting with herself and her stage double, Mills may as well have been twins in real life. In any case, she plays twins who have been separated at an early age, rediscover one another, and plot to reunite their parents and get everyone back where they belong. It’s corny and farfetched, but by and large it works. The twins find one another at summer camp. Sharon is a rich, sheltered, upper-class kid from Boston; Susan is a rich, not-as-sheltered, more carefree kid from California. We know where they’re from because they say so and because Mills changes her accent for each girl. Unfortunately, she still sounds British most of the time, but I wouldn’t hold that against her. So Sharon and Susan meet coincidentally at camp, and it’s hate at first sight. Taking an immediate dislike to the fact that they look alike, they begin to play practical jokes on one another, culminating in a knockdown, drag-out fight, for which they are duly punished. They’re forced to live together for the rest of the summer, a punishment suited to fit the crime. Naturally, once they’re together they get to like each other, and from there it isn’t long before they figure out they’re related: each having the same birthday and each living with a single parent, Sharon with her mother in Boston, Susan with her father in Monterey, CA. Their initial discovery that they’re long-lost twin sisters is surely the most touching scene in the picture and crucial for believing everything that follows. The trick now is their getting their parents back together. They decide to switch places and set a trap for the unsuspecting mom and dad. It’s rather a long film for its slender story line, and I would have suspected had I seen it on its first release that it was possibly too long for its intended audience. But it obviously became a smash hit, so what do I know. The plot also requires that one suspend one’s disbelief considerably. I mean, even identical twins can’t be so convincing as to fool both their parents, I’m sure. But these do. Brian Keith plays the father, Mitch, in a gruff, papa-bear, Brian Keith sort of way. Maureen O’Hara plays the mother, Margaret, and she never looked more beautiful. Except perhaps today, forty years later, in a DVD interview. The magic of genes, money, and modern science, I suppose. The girls’ meetings with the mother and father they had never known (and can’t now reveal themselves to) are the second most touching scenes in the film. Charlie Ruggles plays the girls’ grandfather as the wise, kindly old fellow he always seemed to portray in movies, and Cathleen Nesbitt plays the grandmother, a stern old grump who grows on you. Completing the picture and complicating matters considerably more than they already are is Mitch’s fortune-seeking new fiancee, Vicky Robinson, played by Joanna Barnes. She makes a wonderfully greedy, grasping villain. Most of the film’s comedy derives from the girls’ attempts at deception, as might be expected; however, for me some unintentional humor showed up in the settings. Mitch lives in Monterey, so when his new daughter in disguise returns home, they motor along the Central California coast past Pebble Beach and through the Monterey Peninsula’s famous 17-Mile Drive. Then, when they reach their house, they are clearly arrived in one of Disney’s most-preferred shooting locations, the Golden Oak Ranch near Burbank in Southern California, the same locale used for “Old Yeller,” “Zorro,” “The Swamp Fox,” “Flubber,” and dozens of other Disney studio hits. I guess you have to live in California to appreciate this bit of Hollywood chicanery. 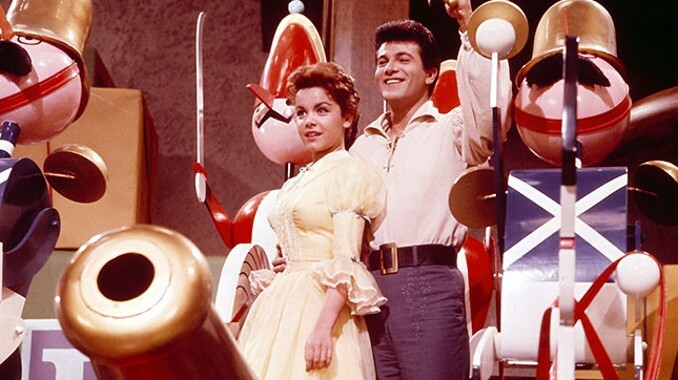 Before I leave it, let me mention, too, that the background songs–“The Parent Trap,” “For Now For Always,” and “Let’s Get Together”–were written by the team of Richard and Robert Sherman, and that the title tune is sung by Tommy Sands and Annette Funicello. Ms. Mills, performing with herself, sings “Let’s Get Together,” with its refrain, “Yeah, Yeah, Yeah.” And this was a few years ahead of the Beatles! Lastly, there’s a bit of fifties’ whimsy in references to Stan Freberg’s old “John and Marsha” soap-opera routine, which may go over most young viewers’ heads nowadays; and a take-off on the “Colonel Bogey March” from “The Bridge on the River Kwai,” which should continue to resonate with audiences despite its age. The film is presented in its theatrical exhibition widescreen size, which, lo and behold, is honestly listed on the keep case as having a 1.78:1 ratio, very close to the dimensions I measured with a ruler. None of this 1.85:1 business when, in fact, the studios almost always fudge on their numbers and shrink the width slightly. The Technicolor print has been transferred exceptionally well to disc, earning it THX certification, with colors that are rich and deep. Perhaps the fuss-budget would say the overall image is a tad dark, with very minor blurring, minor grain, and minor moiré effects. But I wouldn’t. In fact, the image quality is probably as crisp and clear as the day it was first projected on a motion-picture screen. The sonics come to us in a Dolby Digital 5.1 remix, which sounds for all the world like a good, marginally expanded mono. There is little true stereo spread, virtually no rear-channel effects, and little ambiance enhancement present. As in their remixes of other early titles, like “Old Yeller,” it’s hard to tell if it isn’t just a monaural signal widened from left to right. Nonetheless, the audio comes off smoothly and quietly and makes a good impression for its age. THX Optimizer series of audiovisual calibration tests; and twenty-four scene selections. Disc two includes the longer bonus items. The first and most important is an eighteen-minute documentary called “Caught in the Act: The Making of The Parent Trap.” It has interviews and comments by Swift and Mills, plus several others of the cast and crew. A second, newly made documentary, “The Sherman Brothers,” gives us fourteen minutes with the two men who created the music for the film. Then, a third documentary, “Seeing Double,” delivers nine minutes worth of technical information on the special-effects photography used in the film. Next is an old “Disneyland” featurette, “Title Making,” that’s seventeen minutes long; followed by a “Lost Treasures” segment, “Who’s the Twin,” six minutes with the actress, Susan Henning-Schutte, who played the second twin in rear and long shots. After that, director Swift conducts a seventeen-minute interview with Ward Kimble, one of Disney’s most celebrated animators. Finally, there are director and cast biographies, including a twenty-two-minute biographical documentary about Ms. Mills; a production gallery; three theatrical trailers; and a series of radio spots.